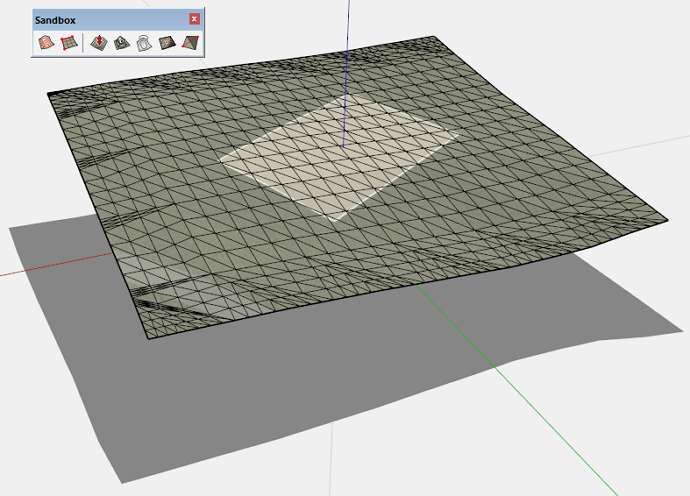 Go grab the .rbz file and install it into SketchUp. 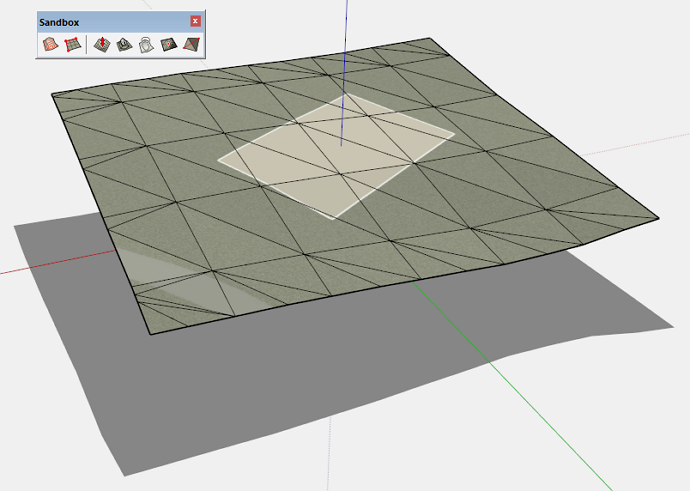 If you use our own ExtensionStore for SketchUp then just do a search for CutNfill. Or you can grab the .rbz file here. Once installed CutNfill adds an entry to the Extensions menu and also can be launched via a toolbar. Typically you will have contours to generate the terrain. In the off chance that your terrain is lacking detail you will need to add detail to have more geometry to manipulate. If you unhide and unsoften/smoothen the edges you can clearly see there just is not enough mesh to manipulate. 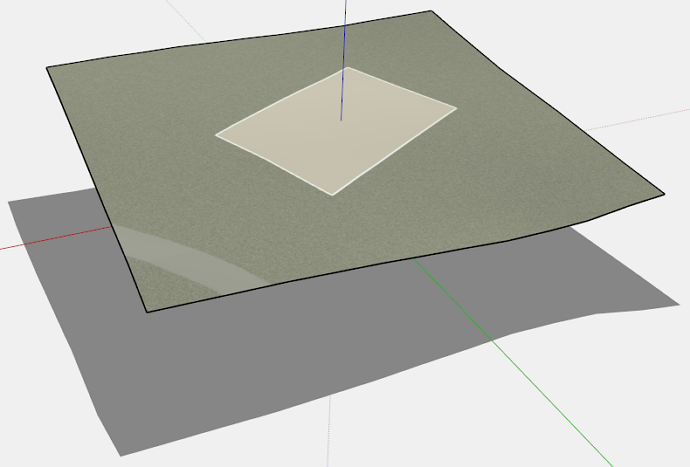 SketchUp has a nifty tool to add more detail called....Add Detail. Select all the terrain geometry and click Add Detail. Depending on your initial mesh density you may have to run this 2 - 3 times. 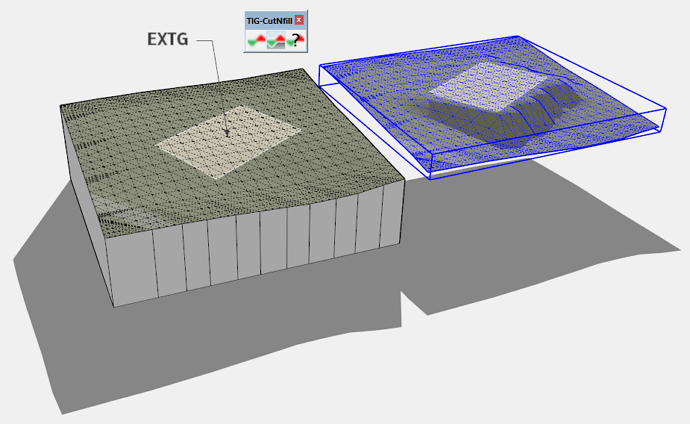 With our terrain prepared you need to Group it and name that Group EXTG for CutNfill to work. Also, move a copy of the Group nearby and name that whatever you wish. The copy will be the terrain we manipulate. To speed up the process of levelling the build area I like to use Vertex Tools. Select the area and use the Gizmo to move the area into position. You can use the Z-Scale handle to level the terrain selection. By typing 0 into the VCB after scaling you are guaranteed to have a perfectly level build area. Now we are ready to use CutNfill. Select the original grouped terrain and use the Skirt tool to add a skirt. Repeat the process for the manipulated group. Now you have all the ingredients you need to extract the fill need for this build area. For CutNfill to extract the fill you need to position both group to occupy the same space. With that done you select both and run the CutNfill. The popup dialog allows you the decide how you want to report the calculations and the decimal precision of the result. When CutNfill completes it will place the cut and fill in it's own group and place some leader text detailing the final calculations. There you have it! 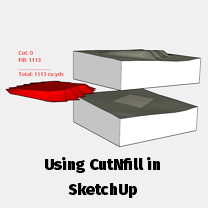 A quick and easy way to calculate the cut and fill needed on site using SketchUp. CutNfill is priced at $20 but you can also trial it for up to 10 operations.